YouTube has made it clear for quite some time that it has a focus on its mobile users, and that’s for good reason. According to a new report, YouTube makes up just shy of 40% of all downstream mobile web traffic in the world. This is simply a staggering figure. Of all of the mobile web traffic in the world, YouTube accounts for the most downstream megabytes by a huge degree. A study (via WNIP) reveals that YouTube currently accounts for 37% of global downstream mobile web traffic. That same study further looks at the rest of the mobile web and it makes YouTube’s numbers even more impressive. The closest competition is, predictably, Facebook which sits at 8.4%. It’s closely followed by Snapchat at 8.3% and Instagram at 5.7%. Facebook Video apparently also makes a dent, coming in at 2.5% of the pie. 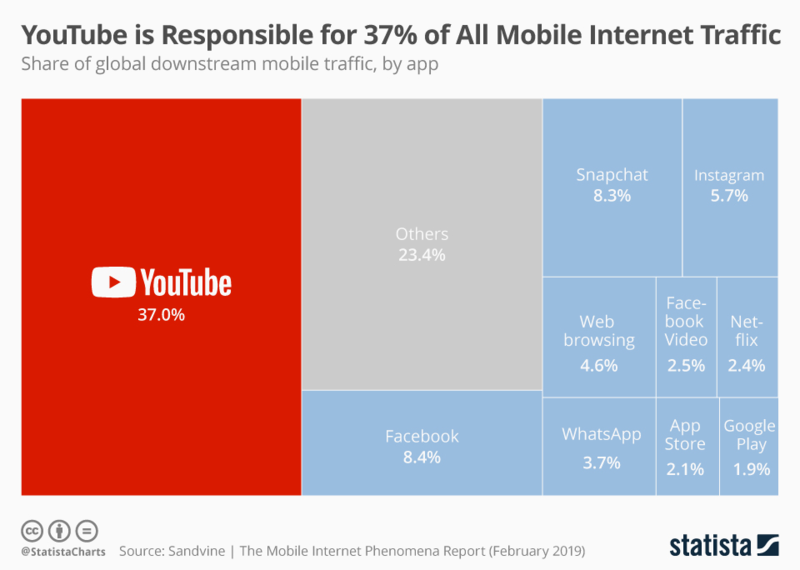 It’s fascinating to me personally that actual web browsing makes up just 4.6% of this chart, with the Google Play Store and Apple App Store making up 1.9% and 2.1% respectively. Netflix, the global leader in web traffic overall, makes up a mere 2.4% of all mobile traffic. To some extent, this makes sense, as content on Netflix is better suited to a TV or laptop where YouTube’s content fits best on a smartphone. No matter how you look at it, YouTube’s dominance on mobile is staggering, and these numbers very much support the competition putting more focus on video.